REDWOOD CITY, Calif. and MADRID, May 9, 2018 /PRNewswire/ -- Equinix, Inc. (Nasdaq: EQIX), the global interconnection and data center company, and Telxius, Telefónica's infrastructure subsidiary, today announced that they are working together on U.S. facilities and services for the next-generation cable landing station architecture for the MAREA and BRUSA cable systems. The two subsea cables will terminate in the U.S. directly into the MAREA and BRUSA cable landing station located in Virginia Beach, VA, and the capacity will extend the backhaul capacity into Equinix DC2 International Business Exchange™ (IBX®) data center, representing the newest innovative design in subsea cable infrastructure. Equinix global IBX data centers are ideal for extending the backhaul capacity of a subsea cable system directly into a high-density data center. This new architecture greatly simplifies network design, offers access to a dense, rich ecosystem of networks, clouds and IT service providers and allows easy access for customers. Leveraging the power of Equinix Cloud Exchange Fabric™ (ECX Fabric™), Equinix customers will have direct access to the MAREA and BRUSA cable systems via a simple cross connect from any IBX data center. Equinix is collaborating with NSPs and CSPs, introducing key innovations in subsea cable design and operations that leverage interconnection and data centers. MAREA and BRUSA will provide state-of-the-art connectivity technology to enable the development of value-added and new generations of cloud services, including content distribution to Southern European and Latin American Markets. The new cable landing station (CLS) architecture is developed to meet the needs of large CSPs for speed, efficiency and open system design. The MAREA subsea cable, which Telxius has recently opened for business, is a joint project with Facebook and Microsoft. It is the highest capacity subsea cable system built across the Atlantic, consisting of eight fiber pairs that will stretch 4,000 miles connecting Virginia Beach, VA, and Sopelana (near Bilbao), Spain. Telxius is responsible for the operation of the cable and leverages its IP, capacity, colocation and security services through it. Telxius has partnered with Equinix to develop and deploy the cable landing station architecture in the Equinix DC2 IBX to support the MAREA subsea cable system. 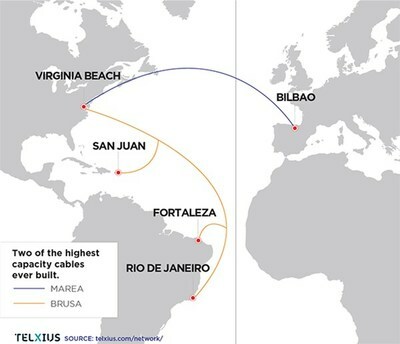 Telxius is also building BRUSA, a new subsea cable over 6,800 miles in length linking Rio de Janeiro and Fortaleza, Brazil, with San Juan, Puerto Rico, and Virginia Beach, VA (USA). BRUSA is on time to be completed by mid-2018. It will provide eight fiber pairs, offering leading-edge technology which will allow BRUSA to support ultrafast transmission capacity and to increase end-to-end connectivity and the availability of ultra-high-speed broadband services. BRUSA is set to offer one of the lowest latency communication links between two of the largest economies in the region, the U.S. and Brazil. Telxius has points of presence (PoPs) in more than 20 Equinix IBX data centers around the globe to support the Telxius network, including DC2 and DC6; MI1 and MI2; SP1, SP2, SP3 and SP4; RJ1 and RJ2 at which the MAREA and BRUSA cable systems terminate. The level of global data traffic is expected to reach 3.3 zettabytes by 20211 and almost every byte touches a subsea cable as cloud service providers, network service providers, content providers and enterprises push to move data globally in real time. The rapid growth of data—from basic web browsing and e-commerce to streaming video and AI—is helping drive a global surge in new subsea cable construction. Twenty new cables will launch in 2018 alone, with capacity of ~700 TB (vs. just six launched in 2016). Total subsea cable bandwidth is expected to double by 2021. Equinix continues to build momentum to meet this rapidly increasingly need for subsea cables through data center design, partnerships and acquisitions. Equinix is home to 1,700+ networks and 2,900+ cloud and IT service providers on its global platform across 52 top markets on five continents. This makes Equinix the Home of the Interconnected Cloud™ and a natural destination for subsea cable systems. Once a company or consortium commits to developing a subsea cable system, it can reach its goals faster by using Equinix as a gateway to the interconnection required by themselves and their customers. Because Equinix is carrier-neutral, subsea system operators can offer excess capacity to customers who otherwise couldn't as quickly or efficiently reach the markets being served by new subsea architecture. "As content providers increasingly drive subsea network development across all routes, pushing traffic on low-latency paths to end users, we can expect to see more cables backhauling optical transmission directly into major data centers. The launches of MAREA and BRUSA fuel this trend, making Equinix's Ashburn campus a direct aggregation node for traffic traversing both the trans-Atlantic and U.S.-Latin America routes." "We're partnering on new cable landing station projects that give our customers improved access to the expanding global subsea cable network. With this next-generation cable landing station design, the cables extend directly to an Equinix IBX data center. That means any user of a subsea cable system that lands inside one of our Equinix global data center termination points has instant, low-latency access to a host of vibrant industry ecosystems inside Equinix, and that's a huge advantage." "This new cable landing station design effectively connects the data center and submarine communications worlds and opens the door to faster growth in bandwidth rates for our customers. This cutting-edge architecture leverages the ultra-high capacity of BRUSA and MAREA, two of the highest capacity cables ever built. It has been developed to fully address the needs of our customers in terms of both capacity and efficiency."